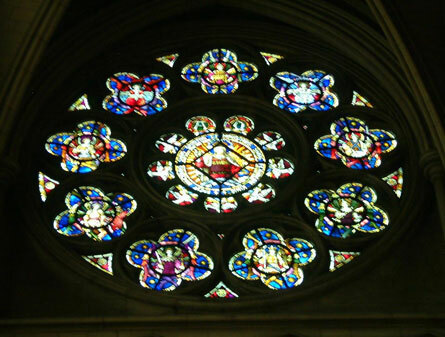 It is an angel window with a Latin inscription in the centre which means “He maketh His Angels Spirits, and His Ministers a flame of fire.” The four lights below represent the four Archangels. 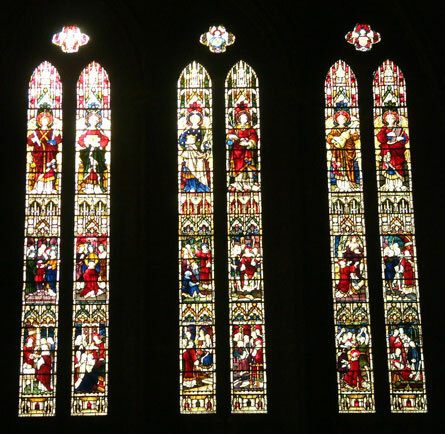 These windows formed part of the memorial to the first Vicar of St.Stephen’s, and were dedicated on Christmas Eve, 1911. Blessed Virgin Mary’s girlhood in the temple. St.Anna the Mother of our Lady. She teaches our Lady the Old Testament. Visitation of the Blessed Virgin Mary to Elizabeth. St.Elizabeth with her son John the Baptist. Birth of St.John the Baptist. Christ appearing to the Women returning from His Sepulchre. St.Salome, wife of Zebedee. Two angels greet the Women at the Sepulchre. Presentation of Our Lord in the Temple. (Central) Our Lady holding the Holy Child. The Annunciation. Appearance of Our Lord to Mary Magdalene on the first Easter Morning. St.Mary Magdalene. Our Lord’s Burial. Death of St.James, who was killed with a fuller’s club. St.Mary the Mother of S.S.James and Joses. Our Lord breaking bread with St.James after the resurrection. 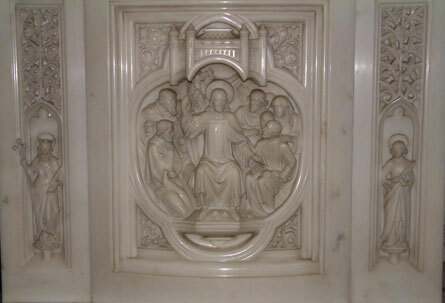 The general scheme of the five apsidal windows is that of the “Te Deum.” The central figure represents Our Lord in Glory accompanied by various figures and angels. 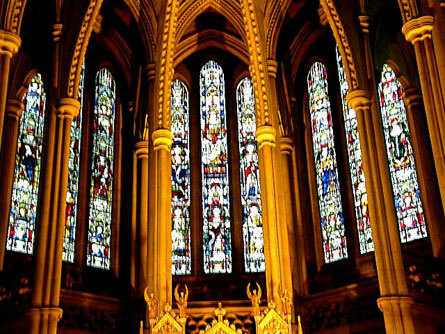 On the north of the central three-light window are the Glorious Company of the Apostles, St.Andrew, St.Peter , St James and St.John. On the south side are the Noble Army of Martyrs, St.Stephen, St.Alban, St.George and St.Thomas of Canterbury. Associated with these are the demifigures which contribute, with elaborate tabernacle canopy work to occupy the areas surrounding the principle figures, and generally fulfil the design. Miriam, the sister of Moses and Aaron, with cymbals. King David with his harp. St.Gregory, whose name is still used in connection with plainsong. St.Aiden, Monk of Iona, and Bishop of Lindisfarne, a great founder of church life in the North of England. 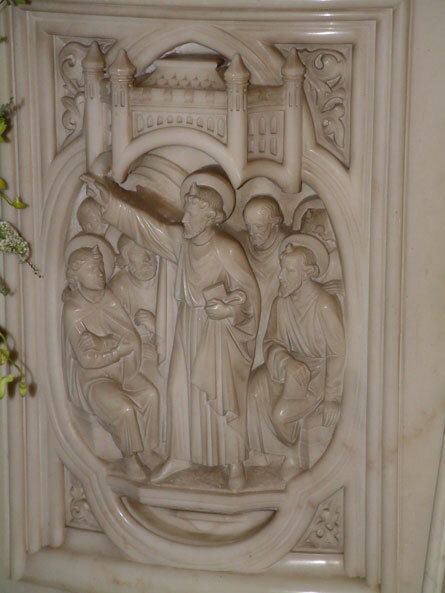 These represent notable disciples of Our Lord in the Early Church: and the Prophets. St.Andrew with the cross on which he was crucified; and Joel. St.James the Great, with the staff, bottle and shell of the pilgrim; and Amos. St. John with the chalice containing a serpent which failed to harm him; and Obidiah. St.Bartholomew with a knife, the instrument of his martyrdom; and Michah. St.Simon with a saw and halbert; and Nahum. St.Mark with a book and St.Barnabas with his book. St.Jude with a boat and fish; and Habakkuk. St.Matthew with quill and his gospel; and Zephaniah. St.Thomas with his set square. He was sold as a slave in India to work as a skilled carpenter, and started a mission there which has its descendants now; and Haggai. St.James the Less, with a fuller’s club and book; and Malachi. St.Matthias with halbert and book; and Zechariah. In The Centre St.Stephen preaching. On the North side St.Stephen’s vision. He is cast out of the city. He is stoned to death. 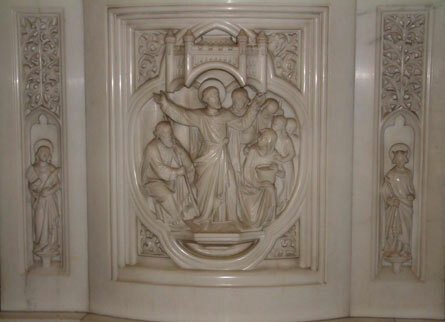 The pulpit of marble shows three scenes from the New Testament. and St.Paul preaching at Athens.